Last season, when I got into scooters, I rode for the sheer joy of it. The practicality was simply gravy for me. Today that changed. Since I’m between jobs, any cost savings I can scrounge together is a very good thing. 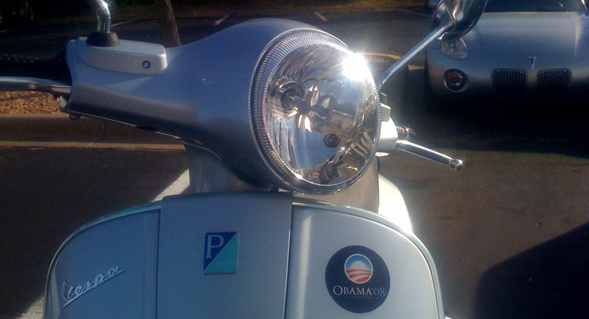 Now riding my Vespa is one more way I can reduce costs. Gas may be less than $2/gallon right now, but getting 2-3X the mpg of my MINI will add up none the less. Every little bit helps. Today I had errands to run. One included getting the first oil service done on the Vespa itself, so taking my scooter made sense. But I had other places to go as well. Now that the weather is bearable and the Twin Cities roads seem to be relatively free of salt and grit, taking my scooter out for errands is my first choice for fun. However today, it was finally out of practicality that I was on two wheels ’round town. Sure, it’s fun, but it isn’t always the most convenient way to get from Eden Prairie to St. Paul in the early Minnesota spring. As I got more and more chilled in the late winter air, I felt a spiritual connection to scooterists all over the world. I felt at one with all those millions of riders across the globe who ride every day not because they love to, but because they have to. I felt such a strong solidarity to all those poor souls I’ll never meet for whom my Vespa GT would cost them a decade’s wages. They’re scooting Seoul, Bangkok or rural Vietnam, perhaps on the most expensive vehicle they’ll ever own. For him or her, it’s either the immense privilege of basic mobility, or just another day delivering flowers in India. Either way, stay safe, my people! I wish I could find under petrol $2 a gallon out here in SoCal…. last fill up $2.39 for 90 octane. oops!… “find petrol under” is what I meant to say.